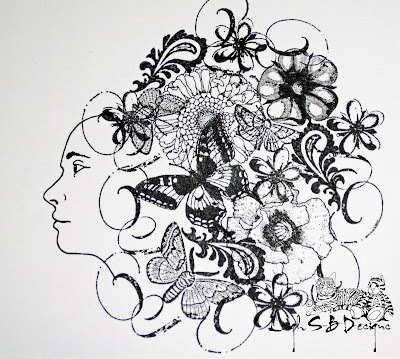 Velvet Paw Creations: ' Steampunk Self Portrait ' Creating Fine Art with Rubber Stamps! A Blockheads Design Team Creation!
' 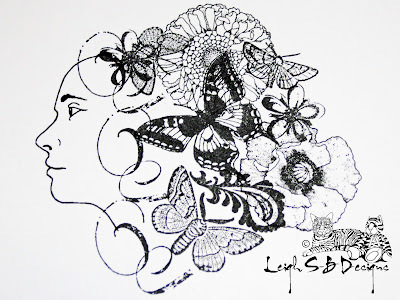 Steampunk Self Portrait ' Creating Fine Art with Rubber Stamps! A Blockheads Design Team Creation! I'm back today with another Blockheads Paper Arts design team tutorial! 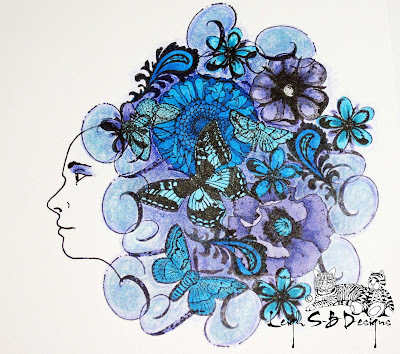 I've designed a really cool Steampunk-style self portrait creation that demonstrates how you can create Fine Art with rubber stamps for a truly unique piece of Art worthy of being framed or for making personalized art cards. I also used metal washes and T!m Holtz Idea-ology embellishments to achieve that perfect Steampunk look! 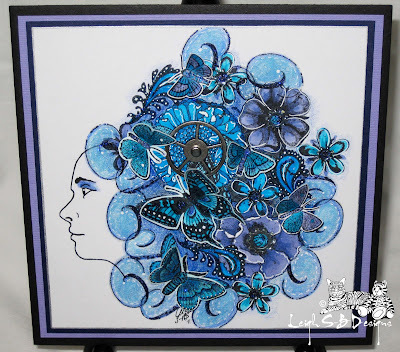 All the stamps I used are from Blockheads Paper Arts exclusive stamp line. Click on each image sheet for more info. All are available unmounted or cut on cling cushion. 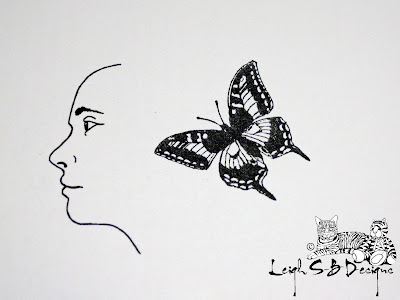 I started out by drawing my own face in profile on white cardstock suitable for use with Copics and stamped the first of the largest images, the Butterfly, with Memento Tuxedo Black ink. I then stamped the large Calendula and Poppy flowers and proceeded to add smaller images. I added the flourishes to give the feeling of flowing hair mixed in with all the flowers and insects. I continued to build up the images until I was happy with the overall design. I then used a square Spellbinder die to cut out the panel. 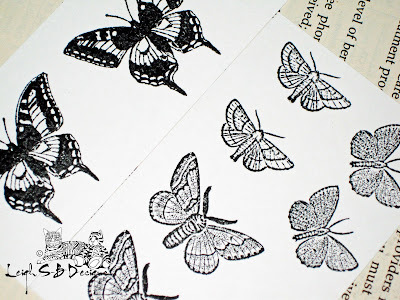 Next I stamped the butterfly and moths a few times on scrap pieces of cardstock and cut them out. I coloured them with Copics and embellished with glitter glue. I love the one that has the gorgeous iridescent ultra-violet glitter in it. I then creased and folded up all the wings. I coloured my self portrait with a combination of Copic markers and Prismacolor pencils. I added glitter glue to the flower centers and to all the flourishes for extra sparkle. I also added highlights to all the areas with a white gel pen. 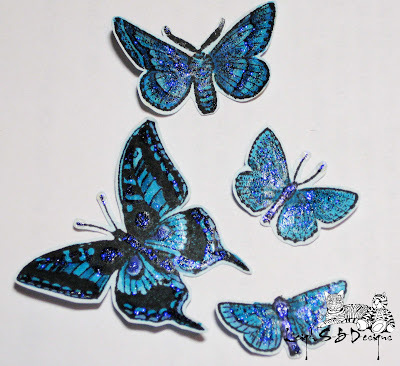 I didn't do any extra shading or multi-colouring to the stamped butterfly and moths though coz later on I glued all the insect cut-outs over those images to give dimension to the piece. I then embellished my self portrait Fine Art piece with various Steampunk elements. I used silver metal washes in three sizes that I picked up from Home Depot - those are the smaller pieces I glued to the centers of all the smaller flowers. I also attached the large silver Idea-ology gear to the center of the Calendula flower with a mini silver brad. 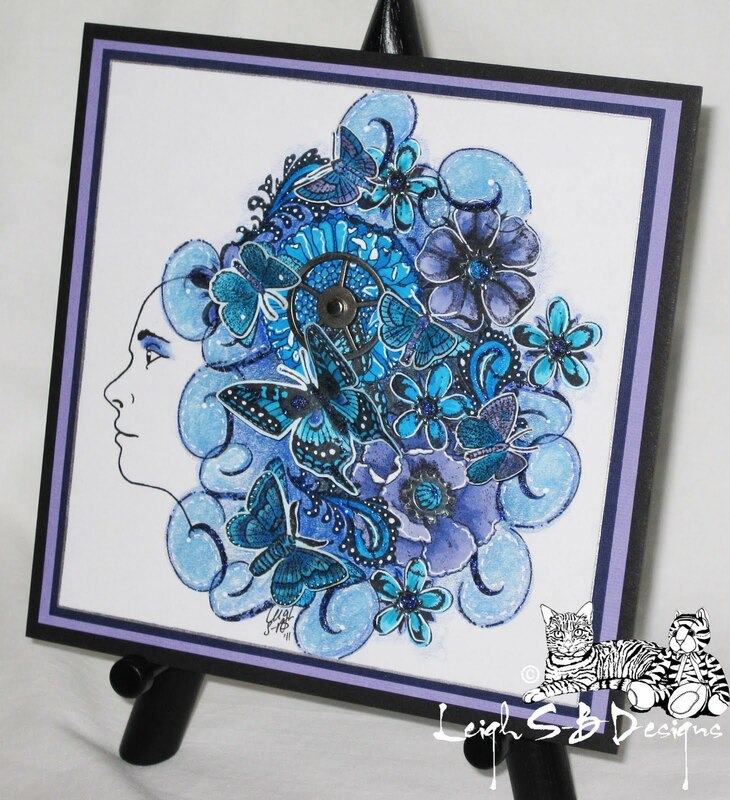 I then layered the art panel onto blue and purple cardstock mats and then finally onto a 7 Gypsies 6"x6" black book board. I intend to mount my piece in a shadow box or frame suitable for hanging on my studio wall. The last step was to adhere all the insect cut-outs to my self portrait. 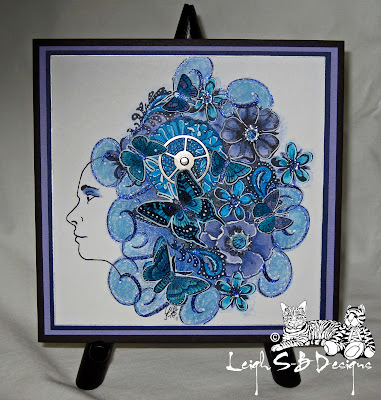 For more Blockheads inspiration check out Karen's blog. She's got some very 'sharp' tags to share with you using the Sewing sheet ;0) Don't forget that Karen is also currently hosting a Blockheads Facebook Challenge! There's an awesome prize up for grabs so go check it out! Hey Mindy! email me at velvetpawcreations@cox.net if you're interested in commissioning a self portrait in the same style with or without the Steampunk embellishments! This particular one is also for sale too. The steering wheel, LOL, is actually a T!m Holtz gear cog and the inclusion of these metal bits is what makes it Steampunk. 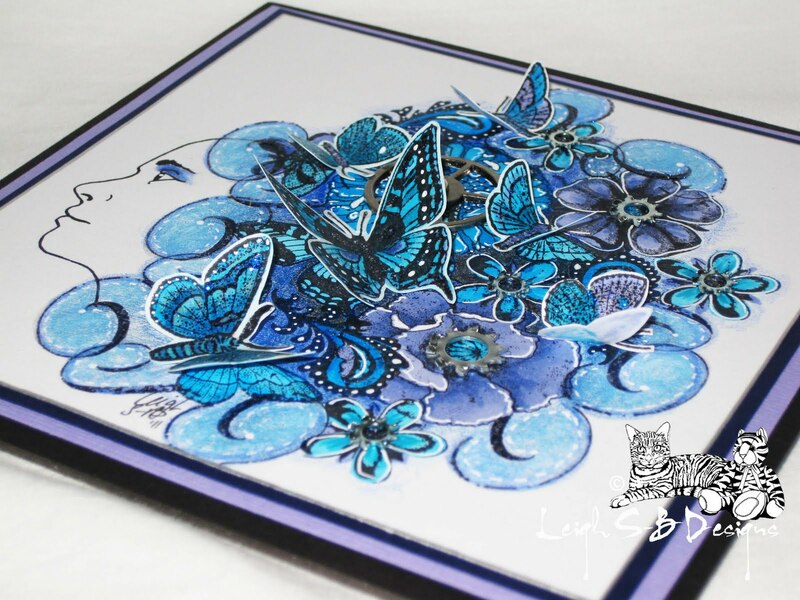 This inspired me to create some cards using the first class quality paper which is EPSON Premium Glossy Photo Paper and a perfect giveaway.